George Orwell’s 1945 classic novel Animal Farm was a satirical critique of Stalinism in the Soviet Union. 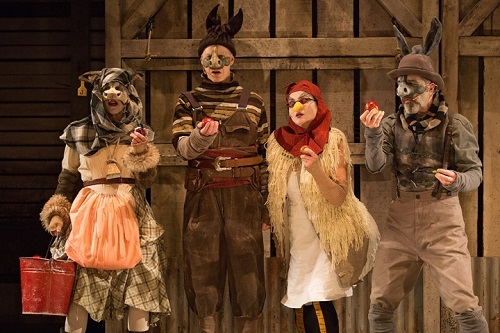 As the program for the production of Soulpepper‘s Animal Farm cheekily notes, “its greatest flaw, identified by a majority of 7th and 8th graders, is that it’s obviously irrelevant to our modern more sophisticated lives.” This new adaptation by Anthony MacMahon takes the premise of the original and applies it it to the issues of today. It also takes the approach of the original, which is not at all subtle. While nuance has a time and place, its not necessary for a hilarious and adept skewering of the current rise of demagogic political leaders. The first half of the play sticks mostly to the plot of the novel. Tired of working for The Man — literally, as the characters are all animals on a farm belonging to a male human — an old boar named Major (Jennifer Villaverde) gives a rousing speech against the tyranny of farmers before he dies. The revolution ensues, and a couple of pigs end up the de facto leaders of the newly liberated Animal Farm. (Having been raised rural myself, I can concur: pigs are very bright and would totally take over chickens, sheep and horses). One of them, Snowball (Sarah Wilson) has a progressive view of the new paradigm of Animalism, and she wants the citizens to work hard and ration their food for long term gains. She plans social programs like literacy and healthcare, and advocates for the economic investment of building a mill that would process the farm’s grains, ultimately leading to more leisure time for everyone. However, she is challenged by Napolean (Rick Roberts), a pig who espouses a more individualist view of society. He encourages the animals to focus on their immediate, personal desires, and using this self-interest he distracts them so they don’t notice things like his hoarding of apples for himself. By the second act, Napolean is firmly in charge, now seeming more of a libertarian, encouraging each animal to concern themselves only with what personally affects them. This divide and conquer tactic works, pitting the veteran , well-respected workhorse Boxer (Oliver Dennis) against his previous friends like Benjamin the cynical donkey (Guillermo Verdecchia) and Mercy the sincere chicken (Raquel Duffy). Boxer can plow nineteen fields in one day, and so is easily influenced by Napoleon into thinking that he is more deserving than the others, despite their differences in physical ability. Napoleon uses minions to disseminate propaganda that establishes a cult of personality around himself, while painting neighbouring farms as threats. He is a capitalist despot, overseeing an economy that encourages animals to spend their hard earned dollars on lottery tickets and unnecessary commercial items, while making paid time off and veterinary visits more and more inaccessible. Poor Boxer resorts to seeing a back alley raccoon (Michaela Washburn) for his hurt foot. The humour, if you can’t tell already from this description, is both wildly farcical and also painfully too real. The staging by the director Ravi Jain is wonderfully inventive and visually pleasing. My companion and I particularly enjoyed the scenes featuring chickens. There’s an egg-laying frenzy, rebel songs sung in a coop, and a character called Poophead (Jennifer Villaverde again) who really pecks up the scenery. There’s a very considered physicality to the portrayals of different animals. Chickens perch at all times, in a squat that betrays laudable development of the performers’ gluteal muscles, with elbows that poke out like little flightless wings. Benjamin has a distinctive split stance and Boxer high steps like a proper Clydesdale. The character development is also impressive; both Mercy and Benjamin have very defined arcs. Mercy begins as a primarily comical character, but becomes incredibly important and admirable, while Benjamin, who in truth is the most intelligent animal on the farm, has to come to terms with all the ways that he has failed. The whole cast emotes very well, despite half their faces being obscured by masks. The masks and other costuming, and the set, are all delightfully designed by the same person, Ken MacKenzie. Whether you’re glancing askance at the situation south of the border, or staring in horror at the potential outcome of the upcoming provincial election (let’s be real: if you’re doing one of those, you’re also doing the other), Animal Farm is an opportunity to indulge in some cathartic laughter, and experience Soulpepper’s exquisite production values. I am surprised by this review, since my experience was far from a positive one. The attempts at humour were, at times, unsophisticated and broad, and the production had difficulty deciding if it were slapstick comedy, satire, dystopian farce or didactic play. Also, as much as I wanted to feel emotionally invested in Boxer’s tragic end…I did not feel very much. The actors were strong, so that shortcoming doesn’t fall on them. I noticed a couple dashed during the intermission…I wish I had joined them. I found this play disjointed and juvenile. It was all over the place. I agree strongly with the previous comment. I was very disappointed and left at intermission. While leaving I heard several other people discussing how they disliked the play and also ran into another couple that chose to leave at intermission on the way to the car park.